Within this book, the author of Frostbitten: 12 Hymns of Misery, Invisible, Yuri and Wagon Buddy returns to ensure you will be looking behind you frequently while reading. 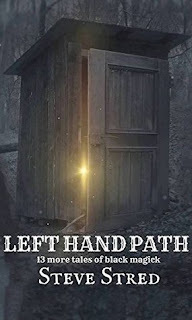 Left Hand Path: 13 More Tales of Black Magick collects all new tales filled with depravity and retribution. Brimming with horror, thrills and creepy chills, the reader is sure to find the hairs standing up on the back of their necks and the occult themes causing them to question the true nature of the lights flickering. When all is said and done, when you finally finish reading this batch of stories, you will have found that at some point, you locked the doors, checked under the bed, and made sure all of the closet doors are closed. I was lucky enough to win this in a giveaway and to my shame it's taking me ages to finally get round to it! But now that I have, I'm so glad. There's a lot to love about this collection. It's dark, fun and full of surprises. I really liked how these stories all start off really normal, beginning with everyday situations we all find ourselves, but then of course it quickly descends into horror and mayhem. There's no chance to stop reading these gripping, fast paced stories. There's a great range of styles, subject matter and genres within, all untied by an underlying current of horror. They're so original you never know which direction Steve Stred is going to take you in. Stand out stories for me in this collection include; The Witch a great tale of powerful women being in total control. Wardrobe malfunction was brilliant, that story just keeps getting darker and darker! Tossers and Thunderstorm are also up there, I loved the mysterious ending of the latter. Head Case really stood out for me too and shows that technological advances aren't always to our advantage. This is a really good collection of tales and can't wait to see what he writes next!